People who suffer from paralysis are confronted with many situations in which they need a helping hand. Electrodes attached to the patient’s scalp measure the brain’s electrical signals, which are amplified and transmitted to a computer. Highly efficient algorithms analyze these signals using a self-learning technique. The software is capable of detecting changes in brain activity that take place even before a movement is carried out. It can recognize and distinguish between the patterns of signals that correspond to an intention to raise the left or right hand, and extract them from the pulses being fired by millions of other neurons in the brain. These neural signal patterns are then converted into control instructions for the computer. The Brain2Robot project has been granted around 1.3 million euros in research funding under the EU’s sixth Framework Programme (FP6). Its focus lies on developing medical applications, in particular control systems for prosthetics, personal robots and wheelchairs. The researchers have also developed a “thought-controlled typewriter”, a communication device that enables severely paralyzed patients to pick out letters of the alphabet and write texts. 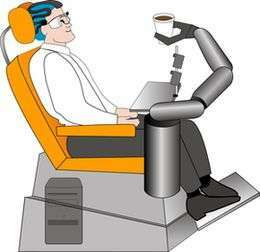 The robot arm could be ready for commercialization in just a few years’ time. BCI technology has potential uses in a great many applications: It could be used, for instance, for playing video games, or as part of safety systems for automobiles providing driver monitoring and driver assistance functions. The development team will be presenting their robot arm at Medica 2007 in Düsseldorf from November 14 to 17 (Hall 3, Stand F92).